We've got some great stuff coming up in March, and we can't wait to show it to you! There's the +6 Bag o' Munchkin Zombies, Munchkin Journal Pack 1, Munchkin Triple Play Set 1 and Set 2, and Munchkin Zombies 4: Spare Parts! Chronicle all your adventures, secret plots, and laundry lists in the Munchkin Journals! Three pocket journals, one each with a cover from Munchkin, Star Munchkin, and Munchkin Cthulhu. Plus a new Munchkin card! Three mini-expansions to spice up your Munchkin sets! Naughty & Nice: Add some holiday spirit to your Munchkin game! Skullkickers: The hit Image comic comes to Munchkin! Fish & Ships: More Ships and more Sharks for Munchkin Booty! 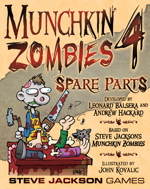 The undead munchkins return once more in this 56-card expansion for Munchkin Zombies, with a bunch of new ways to get those pesky survivors and eat their braaaaaaaiiiins! Take on a new Power, Solo, and show the other zombies on the block who's boss. Pick up the Spare Parts and Bowling Gloves and take on Your Ex-Roommate! Get Your Second Wind so you can defeat the formidable Surgeon General, but make sure you don't get hit with Curse: Dead Heat!